To bring or not to bring the dog… that is the question. Outdoor parties and picnics are a great way to spend time with family and friends, breathe in the fresh air and enjoy some great food, but what about Max? Does he have to stay home alone all day while you are out socializing? With a little planning, Max can enjoy this year's picnic season, too. These tips should help you enjoy summer’s festivities with your best buddy. First, be sure the location of the picnic is dog-friendly and follow all posted rules. Some parks have picnic sites that allow dogs, while others do not. When you arrive at the picnic site, tend to your dog first; you can socialize later. Select an area that provides shade and is away from the food preparation and cooking stations. No matter how easygoing a party is, no one likes a begging dog or food thief. Once you have selected a site, lay down your dog’s bed or blanket and scatter a few treats and toys on the blanket. Fill your dog’s water dish and secure the tie out. Allow your dog to explore the “doggy area” on his tie out. Stay close. Do not abandon your dog at the doggy area. On leash, start to introduce your dog to the guests. 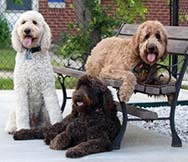 Have high value treats and reward your dog for walking well on leash and sitting for petting. If there are guests who are leery, do not force your dog on them. It could be a bad experience for both the guests and your dog. When the guests start eating, keep your dog in the doggy area and feed him tasty treats in his bowl, or provide him with an enrichment toy, like a stuffed Kong or Tricky Treat Ball. Now it is time to play. Using his favorite toys, engage him in games of fetch, catch or chase. It is best to keep your dog on a long line and let him drag it behind so you can quickly and easily grab control of the leash if necessary. You know your dog best. If he is not very social with people or other dogs at home, chances are he is not going to be very social in a new and stressful environment. In this case, you may be better off leaving him at home. Beware of picnic scraps like bones, corn cobs and other things dogs could choke on. Pick up all trash and debris immediately. Do time-outs. If your dog is getting overstimulated, calm him down in his doggy area; or take him on another walk through the woods to expel his energy. Be prepared to leave early. Certain dogs do not do well at picnics. If your dog becomes way too obnoxious or anxious, perhaps you better take him home. Don't let him spoil everyone else's fun. Likewise, if there are other dogs that make you or your dog uncomfortable, keep your dog's safety a priority and take her home. Always be a good steward and pick up after your dog. NEVER put a dog in a warm car. The temperature can sky rocket in minutes and could be fatal.